What is a Parsley Root? This Old World vegetable is largely used in eastern Europe in soups and stews. It is also known as turnip-rooted parsley. Parsley root is a subspecies of parsley that is grown specifically for its roots. The leaves may be eaten and used like common parsley. 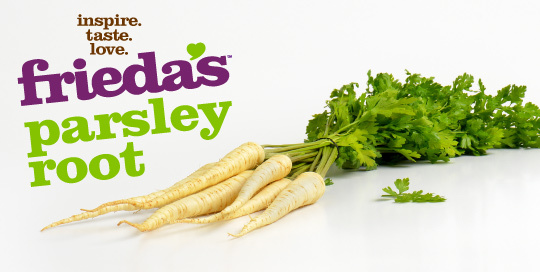 The flavor of the roots is a blend of carrots and celery. Remove tops and keep for flavoring or garnish, if desired. Clean roots with a vegetable brush or peeler. If roots are small, they may be cooked whole or cut, sliced, diced into braises, stews, and soups. Boil or steam and serve with a little butter and salt & pepper. Parsley root is good when puréed with other vegetables such as potatoes and carrots. Parsley Root is low in saturated fat and cholesterol. Refrigerate in plastic wrap up to 1 week.